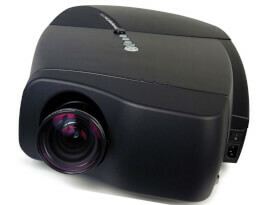 Barco’s SIM 5W projector combines a full WUXGA resolution with Barco’s unique multi-channel optimizations to create a sharp, seamless picture, no matter how many channels. Barco’s SIM 5W can be integrated with Barco’s multi-windowing XDS Control Center software suite. It supports both single and two-channel setups. Barco’s compact SIM 5W is a perfect fit in any environment that requires a projection system with little maintenance needs. The SIM 5W ’s sealed optical engine prevents dust from entering its core and degrading image quality. Its dual-lamp system ensures uninterrupted uptime in case one lamp should go out, minimizing both service needs and downtime, and extending its system lifetime to a great degree.